Sectors Donut launches on 12 September 2016. This major new website offers detailed guidance on how to set up a business in more than 200 different niches, plugging a yawning gap in UK business support. Sectors Donut joins the highly successful Donut family of websites all aimed at supporting small business owners, entrepreneurs and sole traders. 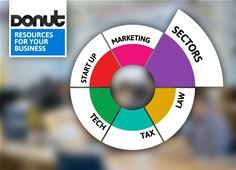 While the latest Donut focuses on specific sectors, the other five websites cover all aspects of running a business including starting up, marketing, technology, tax, and law. “With the launch of Sectors Donut, business owners can now get much-needed sector-specific advice that will help them start up and thrive,” said Miguel Gernaey, Marketing Director EMEA at Sage, which sponsors Sectors Donut. All six Donut websites have now been joined up to form the largest online resource for small businesses in the UK, with more than 20,000 pages of expert advice, guides, checklists, case studies and practical business tools. Sectors Donut alone has 13,000 pages. The launch of Sectors Donut comes soon after the Government closed the £84m Business Growth Service — which included the long-established Manufacturing Advisory Service — and the whole of the Enterprise Directorate of the Department of Business, Innovation and Skills (BIS). “These closures are just the latest in a long line of cuts to Government business services, leaving a huge gap in the provision of support for the UK’s 5.4 million SMEs,” said Rory MccGwire, chief executive of Atom Content Marketing, which owns the Donut websites. “And yet small business owners, sole traders and would-be entrepreneurs are crying out for help and support. With well over half a million unique users every month, the Donut websites are already one of the most popular sources of small business advice in the UK. Now, with the launch of Sectors Donut, the Donuts have become the biggest single SME advice resource. “We can honestly say that we now offer a Donut for every taste,” said MccGwire. “Sectors Donut provides a staggering amount of detailed information on each type of business. Then, if you want to deal with a specific marketing challenge, or a legal problem, you can see what our experts suggest on Marketing Donut and Law Donut. Atom has created Sectors Donut in partnership with Parkes, which specialises in publishing sector content and tax advice. In addition to publishing the Donut websites, Atom Content Marketing creates and licenses business content for a wide range of clients including banks, local councils, law firms, universities, chambers of commerce and accounting firms. Sectors Donut launches on 12 September 2016. Also on that day, Marketing Donut, Law Donut, Tax Donut, Tech Donut and Start Up Donut are relaunching with a fresh new look and a mobile-friendly design.